Reservations need to be made by 12/24/16 to receive discount. Over One Thousand Machines…But Who’s Counting? I am married to a collector, and not just any collector. Not a stamp collector, a coin collector, or unfortunately for me, not a jewelry collector either. My husband collects slot machines! Three wheeled, beautiful, old, large and very large slot machines. We have put a third floor in our house, just for him to display more of his slot machines. Over one-thousand machines…but who’s counting? He reads, studies catalogs, repairs, paints, travels to shows, attends meetings, and basically spends most of his leisure time pursuing this hobby. He started collecting slot machines over 35 years ago, but after he sold his company in 1994 his desire and interest in collecting soared. I am not a collector. I have tried, with his encouragement, to collect turtles, salt and pepper shakers, Limoges, napkin rings, but seem to always lose interest. This is because I don’t have “the bug”. I admire him having a passion that does not stop. Where I get bored with hobbies after some time, he remains true to his passion, his collecting. If collecting is genetic, then it has skipped over our children. Our 31 year old son, Michael, and our 27 year old daughter, Amy, have grown up with this collector of a father. They see him tinkering with his machines in the garage, but don’t seem to desire having more than a couple of anything, electronics excluded! Barry is a collector in its truest form, he enjoys the hunt, the pursuit, and ultimately, the prize! He captured my heart 32 years ago and I am still crazy about my collector after all these years! I still remember buying my first slot in 1973- a Mills Bursting Cherry. It was a real basket case that I bought at a garage sale for a couple hundred dollars. I took it apart, painted it, and with a couple of extra parts, I was hooked for life. I used to joke with my friends that I would not stop collecting until I had them all, not realizing how many thousands of coin op games there were! It gave me a great excuse to keep going, because I truly am addicted. I’m reminded every time I walk into a casino, of the influence and legacy that Charles Fey had in creating a billion dollar industry. Each machine, like unique pieces of art, came with a story that I wanted to learn more about. To name a few, the all wood Pace Comet made during World War II because metal was scarce. The Pace Royal Double, as beautiful as they come, is played with two different coins with one pull! As well as the Polk “Miner”, a piece so life like, that people who see it for the first time think it is a real person! Each piece, so rich with beauty and history, reminds me why I love this hobby. I want to thank my wife, Donna, and children Michael and Amy, for being so understanding. A special thanks to my assistant of thirty years, Judy, who has been so helpful in all my endeavors. And lastly, a thanks to all the great friends I have met through this hobby. 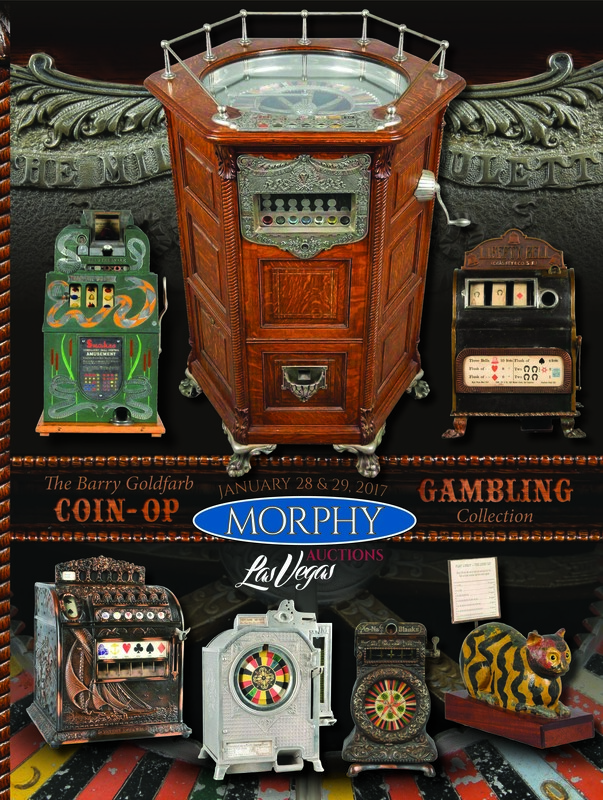 Morphy Auctions’ January, 2017 Las Vegas Coin-Op Event to Feature a Breathtaking Selection of Antique Arcade, Vending, and Gambling Machines. This 1,700+ lot auction follows closely on the heels of the company’s blockbuster coin-op sale in October, 2016 and features many world class machines consigned directly from the Barry Goldfarb collection. Morphy Auctions is pleased to announce this multi-million dollar sales event to be held on Saturday, January 28th and Sunday, January 29th, 2017 starting at 8am PST both days. All lots from this auction are on display in Morphy’s Las Vegas auction gallery and available for preview now. Let’s take a gamble and start off by reviewing this sale’s remarkable selection of countertop slot machines. Lot #155, a Charles Fey Liberty Bell slot machine and shipping crate, rings true with its $150,000-250,000 estimate. This 1895 example, in working, all original, untouched condition, is considered the apex of all coin-op gambling machines ever manufactured. Lot #903, a circa 1905-1910 5¢ Caille Liberty package gum slot machine, believed to be the only known surviving example, is estimated at $120,000-$225,000. It was designed to sidestep the gambling laws of the time by dispensing a pack of gum with every play; unlike other machines with a vending element, this model has the gum vendor on top of the machine. Lot #156, an early 1900’s 1¢ Caille Hy-Lo poker machine, takes the high road with its $20,000-$40,000. This royal flush example is in working, untouched, all original condition, including the marquee with its paper award card. Lot #5, a late 1930’s 5¢ Mills Novelty Co. Hoke Snake slot machine estimated at $25,000-$50,000, features a distinctive serpentine motif on the upper and lower castings along with the skill element. To the best of our expert’s knowledge, this is the only known example with this amazingly eye-catching detailing. And it’s a grand slam with lot #6, a 1910 1¢ Caille base-ball slot machine, estimated at $10,000- $15,000. Enthusiasts will also want to drop a dime on this sale’s amazing offering of antique floor model gambling machines. Lot #306, a circa 1905 5¢ Mills roulette slot machine, would be a head-spinning addition to any collection. This extraordinarily rare example, in phenomenal, all original condition with nickel plated iron castings and a handsome quarter sawn oak cabinet, is estimated at $150,000- $300,000. Lot #154, an 1899 5¢ and 25¢ Mills “Double Dewey” musical slot machine, is worth a double – or even triple – take. This outstandingly constructed and decorated machine features an oak cabinet with recessed panels, carved appliques, fluted columns, ornate cast iron claw feet, and reliefs of Admiral Dewey and Mozart. It is well in tune with its $60,000- $80,000 estimate. Any jury would find lot #304, a 5¢ Mills “The Judge” musical cabinet slot machine, guilty of being remarkably desirable. This unusual example, featuring an oak cabinet with recessed panels and carved applique details and ornate cast iron elements, is estimated at $15,000-$30,000. Lot #103, a circa 1901 5¢ Caille New Century musical Detroit slot machine can play up to six coins at a time and is estimated at $20,000- $30,000. And there’s gold in the hills with lot #307, a 1949 life-sized carved wooden 5¢ Pace “8” Star Bell Frank Polk miner slot machine, estimated at $20,000- $30,000. This sale’s amazing selection of over 300 trade stimulators leaves nothing up to chance. Lot #253, a 1920’s era 10¢ Lukat “The Lucky Cat” trade stimulator, will have collectors feline groovy with its $20,000-$40,000 estimate. It rewards winning players with a gumball and cigars. Lot #191, an early 20th century cast iron 5¢ Watling “Color Match” trade stimulator, is noteworthy for its condition as well as its original side vendor. It is estimated at $20,000- $40,000. Lot #937, an early 1900’s 5¢ Mills Bulls Eye Counter Wheel trade stimulator, is certain to hit the mark with its $15,000- $25,000 estimate. This example, in excellent, unrestored, all original condition features ornately detailed castings affixed to a matching cast iron rotating base and a near mint tin litho color wheel. Lot #1049, a circa 1935 5¢ Superior Vendomat cigarette vender trade stimulator, will meet its match with its $8,000 – $15,000 estimate. And it’s all hands on deck with lot #341, an early 20th century 5¢ Mills Novelty “The Pilot” nautical themed countertop trade stimulator, estimated at $15,000- $20,000. This beautifully detailed cast iron example has a 6-way coin head and one reel with images of spades, hearts, clubs, diamonds, an anchor, and a sailor; winnings are paid out in trade checks ranging from 10¢ to $2.